This is one of our favorite recipes when you want something different. I remember my grandmother making chicken and pasta years ago. She would even add potatoes and sometimes Fava beans to the recipe. Take a moment and enjoy Chef John’s take on Chicken Spaghetti. 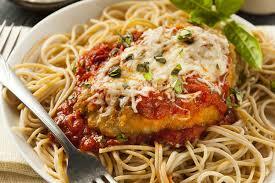 Pasta is a staple food of traditional Italian cuisine, with the first reference dating to 1154 in Sicily. 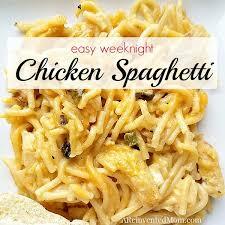 It is also commonly used to refer to the variety of pasta dishes. Pasta is, typically a noodle made from an unleavened dough of a durum wheat flour mixed with water and formed into sheets or various shapes, then cooked and served in any number of dishes. It can be made with flour from other cereals or grains, and eggs may be used instead of water. Each traditional pasta dish is defined by a specific kind of pasta, a specific cooking style and a specific sauce or condiment. There are large number of evolutions and variants of the traditional dishes. 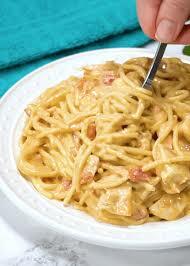 Pasta is also often used as complementary ingredient of some soups, but these are not considered pasta dishes. The various kinds of pasta, are categorized as pasta secca (dried pasta), pasta fresca (fresh pasta), pasta all’uovo (egg pasta), pasta ripiena (filled pasta or stuffed pasta, like ravioli), gnocchi (soft dough dumplings). The cooking styles are categorized in: pasta asciutta (or pastasciutta, in which the pasta is boiled and then dressed with a complementary sauce or condiment), pasta al forno (baked pasta, in which the pasta is incorporated into a dish, along with the sauce or condiment and subsequently baked) and pasta in brodo (pasta in broth, in which the pasta is cooked and served in a broth, usually made of meat). The sauces (mostly used for pasta asciutta and pasta al forno) are categorized into two broad groups: sughi rossi (red sauces, with tomatoes) and sughi bianchi (white sauces, without tomatoes).